The narwhal of the polar oceans is an absurd creature. At over three thousand pounds and up to five meters long, it is not the dimensions of this medium-sized whale that encroach on the ridiculous. Instead, it is the humungous tusk, itself measuring anywhere up to three meters - or more than half the length of the body again - that has cemented the sea-unicorn into legend. The Inuits believed that a woman lost to the sea was transformed into a narwhal and that her knotted hair was morphed into the twisted tusk. Many animals are adorned by horns, composed essentially of hair, but the narwhals tusk is not a horn. It is a tooth. 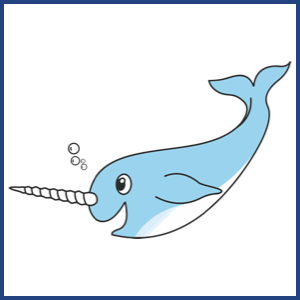 We don't understand the selective forces that played out during the narwhals' evolutionary past which favored the building of their tusks. But since males have tusks and females seldom do, it could be that the origin lies in sexual selection, like the peacocks plumage, a decoration used to attract a mate, but one driven to ridiculous lengths by countless generations of picky females. The tusk doesn't seem to be used for fighting, while narwhals have been seen to slam their tusks into small prey, stunning them before consuming them. Some evidence suggests that it is a sensory organ for absorbing information about the environment, a probe taking a reading of the surrounding ocean. Observations have also shown narwhals rubbing their tusks together, perhaps as a form of communication or sociality. Besides this, what struck me the most when I first read about the narwhals tusk was its striking asymmetry: the tusk invariably grows out of the left side, it is an evolutionarily refashioned upper left canine. Unlike the central rhinos horn or the bilateral tusks of elephants, the narwhals tusk exhibits a conspicuous and consistent left-right bias. And that's not the only asymmetric element of the tusk. The surface is also indented by grooves that form a helix which twists leftwards as you follow from the point of view of the narwhal, from the base to the tip of the tusk. Very rarely, narwhals have been observed with bilateral tusks - in these cases, both of their two teeth grow several feet into tusks, one on the left and one on the right - but the helicity of the grooves is not reversed on the right-sided tusk. There are countless other examples of curious left-right asymmetries in the animal kingdom. Two of my favorites come from the bird world: crossbills and wrybills. Crossbills are small finches that feed on conifer seeds. They have an asymmetrical beak in that the upper and lower bills do not meet to make a single point but instead cross each other such that the tip of the lower bill sits to either the left or right of the upper bill. The upper and lower bills of the wrybill do meet, but, in this case, the entire beak is bent off to one side, always to the right. Left-right asymmetries in body shape are also evident in many species of fiddler crab, a group which often exhibits heterochely, the uneven development of the claws. The large claw can be up to 25 times heavier than its contralateral equivalent. It is waved by males as a symbol of strength during courtship and as a warning to rivals. Should the crusher claw be wrenched off in a fight, the smaller claw on the opposite side claims precedence by growing larger to form the new crusher. In these species, the lost crusher claw regenerates into the smaller type, thereby flipping the left-right asymmetry. Not only that, but males of some species regenerate sham claws that masquerade as impressive to the eyes of discerning females and adversary males but are actually structurally weak and puny. This quick and cheap solution allows them to bluff about their fighting abilities so they can win battles by intimidation before coming to blows (when they would presumably be outed as frauds). All of these asymmetries exist on a canvas of overt symmetry. The overall body plan of vertebrates, and of most animals, is one of bilateral symmetry. Dividing a narwhal in two by a longitudinal section through the face and down the middle to the tail fin would leave you with two fairly equally shaped pieces of whale, one piece a mirror image of the other (with the exception of the of tusk, of course). We humans are similarly bilaterally symmetrical with our pairs of eyes, ears, arms, legs, one on each side in approximately the same position, and our roughly symmetrical nose and mouth. External differences between left and right are usually minor and subtle developmental fluctuations, an embryological noise. But when asymmetries are so astonishingly conspicuous, like the narwhals tusk, the beaks of the crossbill and wrybill, and the fiddlers claw, I can't help but be drawn to them: they are fascinating. What evolutionary and developmental mechanisms give rise to these asymmetries? Why is the direction of some asymmetries determined by genetics but others seemingly not? Are vertebrate body-level asymmetries evolutionarily linked to other asymmetries in the animal kingdom like the chirality of snail shell coiling? And are they connected by some causal chain to deeper asymmetries in the Universe? For instance, do the asymmetries inherent in the molecules that compose us have any influence on anatomical asymmetries? If instead of L-amino acids life on earth used their mirror image counterparts the D-amino acids, would the the narwhals tusk be on the right? We do not know the answers to these questions, but they sure are fun to think about.